Denise didn’t want to go to the gym. Her life was just too crazy. She enjoyed working out at home and used a treadmill regularly to get in an evening walk. She was entering middle age, however, and she knew her muscles were not what they used to be. Denise is right to be looking into adding some strength training to her routine. Scientists are discovering that resistance training can be just as important to our long-term health and wellness as aerobic exercise. In 2012, for instance, researchers noted that inactive adults experience a 3 to 8 percent loss of muscle mass per decade, along with a reduced metabolism and increased fat accumulation. Just 10 weeks of resistance training can increase resting metabolic weight by 7 percent while reducing body fat, boosting cardiovascular health, promoting bone development and easing back pain and fibromyalgia. However, what if you don’t have a weight room or can’t make it to the gym? No problem — all you have to do is use your bodyweight, and you can experience similar benefits without all the equipment. Bodyweight exercises are just what they sound like — strength-building exercises in which you use your bodyweight as your resistance tool. You don’t need free weights or machines, only your own body and gravity. These exercises wouldn’t work on the moon, for instance. Typical movements in any bodyweight exercise include pushing, pulling, bending, balancing, twisting and squatting. The movements are meant to strain your muscles, so they have to work to get you where you want to go. Some of the most common types of bodyweight exercises are push-ups, pull-ups and sit-ups. You probably did all these when you were a student in school. There are many more that you may not be aware of, however, that can work various muscles in the body. With bodyweight exercises, you can work your arms, legs, glutes, shoulders, core muscles, back muscles and more. In addition, because of how they work, they also challenge your balance and flexibility as well as your strength. If you don’t have a weight room in your home, and you’re finding it tough to get out to the gym, bodyweight exercises can be a good alternative. However, even if you’re a regular gym rat, you can benefit from a bodyweight workout. Below are seven reasons why. If you want to see fast results, bodyweight exercises may be the way to go. Particularly those that involve “plyometrics” can be very efficient at helping you get stronger, faster. Plyometrics, also called “jump training,” are those types of bodyweight exercises that involve jumping and hopping and other types of explosive movements. In one 2016 study, for example, researchers found that just six weeks of resistance training combined with plyometrics improved strength and sprint performance. A second study showed similar results, with six weeks of plyometric training alone increased strength and nerve response in the muscles. In another study, adding plyometric push-ups — push up and clap — to the standard bench press training helped participants get stronger faster than those who did bench presses alone. When you do bodyweight exercises, you can move quickly from one exercise to the next because you don’t have to go to one machine, and then get off and set up another. That means you can keep your heart rate up and further challenge your muscles. This is similar to high-intensity interval training and can produce both strength gains and weight loss more efficiently than just aerobic or strength training alone. Researchers reported in 2016 that participants who combined high-interval training with regular gym training improved their strength and cardiorespiratory fitness levels more than those who performed gym training alone. You can make similar modifications to make your exercises easier if you need to. Doing push-ups with your knees on the ground is one good example. The common sit-up is one type of exercise that will work your core, but there are many more. In fact, the nice thing about bodyweight exercises is that just about all of them naturally work your abdominal muscles. Bodyweight exercises, by nature, work several muscles groups at once. They also frequently challenge your balance, and you have to use your core muscles to stay in position. They’re unstable by design, and you have to use all your muscles to center yourself. Imagine for a moment doing a single-leg press on a machine. Most likely, you can do one while relaxing your core or using it very little. However, you can’t avoid tightening your core muscles when you do a one-legged squat. If you’ve ever performed a set up push-ups, you know how it feels—by the time you stop, you’re usually panting pretty hard. That’s a sign that your heart is working, and that’s a good thing. There are a number of bodyweight exercises that get your heart pumping while they’re strengthening your muscles. That means that you’re giving your heart some exercise at the same time, which is healthy for your cardiovascular system. The less you rest between exercises, the better cardio workout you’ll get. Strength training alone, though, even without the aerobic component, is good for your heart. It can decrease blood pressure and stress and improve your cholesterol levels. The American Heart Association recommends strength training at least twice per week. “Stronger muscles also lead to a boost in your metabolic rate,” they say, “which means you’ll burn more calories even when your body is at rest.” That, in turn, can help you maintain a healthy weight, which is another plus for cardiovascular health. Even better, a 10-15 minute bodyweight workout can give you both your strength training and aerobic training at the same time. For most of us, saving time is a definite bonus, so this can be one big plus in the bodyweight column. 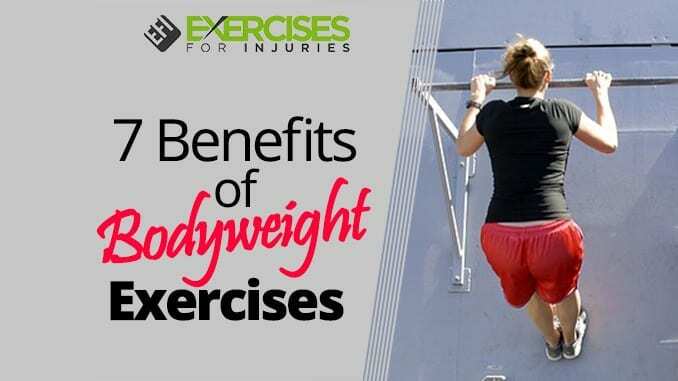 This is probably the benefit you thought about first when considering bodyweight exercises. They don’t require any equipment of any kind. You don’t need weights, resistance bands, machines or even workout clothes, although they’re likely to make the exercises more comfortable. That means you can do bodyweight exercises at home. However, you can also do them when traveling, so you don’t lose what you’ve gained when you go on vacation or on a business trip. You can even do them at work. If you have a long day that bleeds into your regular exercise time, you can take a few minutes to perform a few bodyweight exercises and do something good for your body. When you lift weights, you don’t typically move a lot. You perform the lift in a small space and try to limit any excess movement to help reduce the risk of injury. Often you’re sitting or lying down, so you have the chair or bench to support you. In other words, regular weightlifting does very little, if anything, for your balance. Bodyweight exercises, on the other hand, help you work on your balance. These exercises use a variety of positions and postures that you to use a greater range of motion. Often, you’re standing on one leg, bracing yourself up on one arm, or bending back and forth in such a way that you have to balance yourself. That’s good news because studies show that if we’re not working on it, we all start to lose our balance as we age. That can lead to falls and other injuries that can severely affect quality of life. In fact, one out of three people aged 65 and older fall each year, resulting in more than 20,000 deaths in the year 2009. It’s not only about your muscular strength. The sensory cortex of the brain takes in information from your surroundings to help you keep your balance as you move about your day, but age can make that cortex less sensitive. The processing of the environmental information slows down, which can result in a stumble or fall. To avoid this outcome, all you have to do is continue to practice and challenge your balance. Bodyweight exercises help you do that. They can also help increase your flexibility as opposed to weightlifting, which usually restricts it. Weightlifting exercises can lead to injuries. Common ones include back pain and disc herniation, tendonitis, shoulder injuries and tears, tennis elbow, hamstring pulls and tears, knee pain, often from patellar tendonitis, and more. Research has also shown that weight training is commonly associated with fractures and dislocations, most common when using free weights. Proper technique helps, but if you’re just getting started with strength training, or if you’re concerned about injuries for other reasons, bodyweight exercises are the way to go. 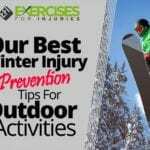 Although you can still injure yourself, particularly if your form is off, you have a lower risk of injury compared to using free weights and machines. “Bodyweight training is safer as it doesn’t involve the lifting of heavy weights and doesn’t require any specialized training,” says professional training Jeff Cowan. Because you’re using your own bodyweight, your joints can more adapt to the training easily and usually even benefit from it. 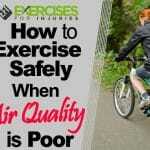 You’re also more likely to feel when you’re “off,” and can adjust your exercise as needed to avoid injuries. In addition, you’re typically using multiple joints and muscles, rather than isolating one or two, so you’re getting more support in the movement, reducing strain on any one particular joint or muscle group. One of the other benefits about these exercises is that they don’t cost anything. No gym fees, no equipment fees — nothing. The inchworm: Start by standing up tall. Bend over and touch your fingertips to the floor, keeping the legs straight if you can. Lower down slowly, and walk your hands forward into a push-up position. Hold for a few seconds, and then walk your feet up to meet your hands. Repeat across the room for four or five reps. The burpee: One of the best bodyweight exercises for working your heart too, the burpee is challenging. Stand tall with your feet shoulder-width apart. Jump up, clap your hands over your head and then bend down into a squat. Jump your feet behind you and lower down into a push-position. Perform one push-up, then jump your feet back up between your hands, and jump back up to your feet. The push-up strengthens your arm and shoulder muscles as well as your core. The jumping gives you a burst of cardio. Bear crawl: Get down on your hands and knees. Then, rise up on your toes — similar to a downward dog yoga position — hold for a moment to get your balance, then reach forward with the right arm and knee, then the left arm and knee. Single leg deadlift: Stand with the feet together. Lift the right leg behind you slightly, then lower your upper body while raising the right leg behind you. Your left knee will bend a little naturally. Reach your arms toward the floor, touching the floor if you can. Raise up and lower the right leg, then repeat on the other side. L Seat: Sit on the floor with your legs straight out in front of you, feet flexed. Place your hands palm down on the floor by your hips. Round your torso a little, and lift your hips off the ground. Hold for 5 to 10 seconds and release. For best results, work your bodyweight exercises into a routine. Try 10 push-ups, 30 jumping jacks, a 15-second plank, five burpees and then 20 squats, for example. Repeat three to five times. Vary up the routine to include more exercises that are particularly challenging for you. 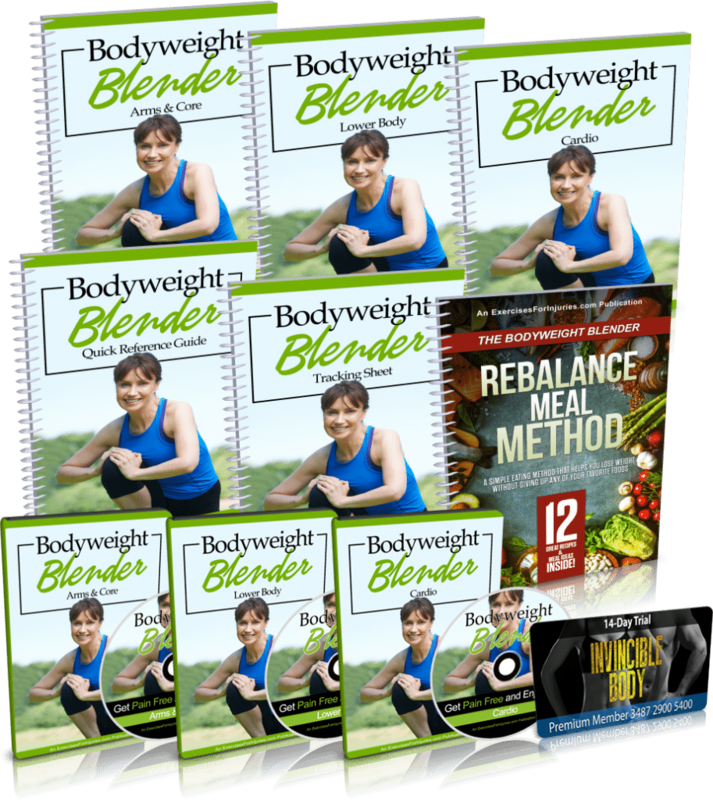 If you are looking for ways to lose weight, build muscle, have more energy throughout the day and get healthier without having to become a total health and fitness nut, then check out the Bodyweight Blender program. Behrens, Martin, Anett Mau-Moeller, Karoline Mueller, Sandra Heise, Martin Gube, Nico Beuster, Philipp K. Herlyn, Dagmar-C. Fischer, and Sven Bruhn. “Plyometric training improves voluntary activation and strength during isometric, concentric and eccentric contractions.” Journal of Science and Medicine in Sport 19, no. 2 (February 2016), 170-176. http://www.sciencedirect.com/science/article/pii/S1440244015000377. Bernstein, Lenny. “Work on Your Balance Now to Avoid Falls when You’re Older – The Washington Post.” Washington Post. Last modified June 24, 2013. https://www.washingtonpost.com/national/health-science/work-on-your-balance-now-to-avoid-falls-when-youre-older/2013/06/24/5c49349c-d813-11e2-a9f2-42ee3912ae0e_story.html. Cofré Lizama, L. E., Mirjam Pijnappels, Gert H. Faber, Peter N. Reeves, Sabine M. Verschueren, and Jaap H. Van Dieën. “Age Effects on Mediolateral Balance Control.” PLoS ONE 9, no. 10 (2014), e110757. http://journals.plos.org/plosone/article?id=10.1371/journal.pone.0110757. Cowan, Jeff. “Bodyweight Vs Weights? Extensive Analysis Bodyweight Training Arena.” Bodyweight Training Arena. Accessed October 3, 2017. http://bodyweighttrainingarena.com/bodyweight-vs-weights/. Giannaki, C. D., and Et al. “Eight weeks of a combination of high intensity interval training and conventional training reduce visceral adiposity and improve physical fitness: a group-based intervention.” J Sports Med Phys Fitness. 56, no. 4 (April 2016), 483-90. https://www.ncbi.nlm.nih.gov/pubmed/25567049. Mangine, Gerald T., Nicholas A. Ratamess, Jay R. Hoffman, Avery D. Faigenbaum, Jie Kang, and Aristomen Chilakos. “The Effects of Combined Ballistic and Heavy Resistance Training on Maximal Lower- and Upper-Body Strength in Recreationally Trained Men.” Journal of Strength and Conditioning Research 22, no. 1 (2008), 132-139. https://www.ncbi.nlm.nih.gov/pubmed/18296966. Mazur, Lynnette J., Robert J. Yetman, and William L. Risser. “Weight-Training Injuries.” Sports Medicine 16, no. 1 (1993), 57-63. https://www.ncbi.nlm.nih.gov/pubmed/8356377. Rodriguez-Rosell D., et al., “Effects of 6 Weeks Resistance Training Combined with Plyometric and Speed Exercises on Physical Performance of Pre-Peak-Height-Velocity Soccer Players,” Int J Sports Physiol Perform, March 2016; 11(2):240-6, https://www.ncbi.nlm.nih.gov/pubmed/26218231. “Strength and Resistance Training Exercise.” American Heart Association – Building Healthier Lives, Free of Cardiovascular Diseases and Stroke. Last modified March 24, 2015. http://www.heart.org/HEARTORG/HealthyLiving/PhysicalActivity/FitnessBasics/Strength-and%20Resistance-Training-Exercise_UCM_462357_Article.jsp.